The days of sorting plastic from paper could soon be in the past if Blaine County follows the lead of other counties statewide in starting a no-sort curbside recycling system. Char Nelson, the county's director of operations, presented the various options for recycling methods at the Blaine County Recycling Center during a budget-request hearing Monday. "When the recycle center was taken over by the county, there was a public expectation that we would be researching options," Nelson said. "This is a first touch." However, the switch could mean a drop in revenue if the program did not increase participation. 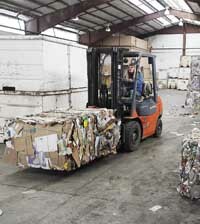 "It would change the way we do business at the [recycling] center," Nelson said in an interview. "It would allow for a single truck to pick up everything." Single-stream or co-mingled recycling is when recyclables such as aluminum, paper, plastic and cardboard are all collected in the same bin. Unlike the current curbside sort program, residents wouldn't need to separate anything except for glass, and the labor required by the hauler is significantly less as well. One of the main benefits is that this sort of system reduces the burden on users, who then tend to recycle more. Boise switched to a co-mingled curbside recycling program in 2009 and saw increases in both the volume of recyclables as well as the number of participants. "It's been dramatic," said Catherine Chertudi, solid waste programs manager for the city. Chertudi said the volume of recycled material went from 16 pounds per person in 2009 to more than 30 pounds per person this year. Participation rates jumped from 75 to 95 percent. "We can't go anywhere without someone telling us how much they like the no-sort recycling program," she said. "[People] love it." Sherry Jeff, utilities director for the city of Twin Falls, said she saw participation rates jump from 20 percent to 80 percent when Twin Falls implemented its single-stream program in January. Nelson said she would expect to see a rise in recycling rates in the county if single-stream recycling became the norm. "Single-stream is attractive," she said. "People feel good about it, quantities go up." However, mixing recyclables can result in a lower-quality product, affecting the rate the county can receive for its materials. "When you co-mingle, you can have contamination," Nelson said. "The quality is lower, and we receive less money for the recycled products." The lower rate is due to the lower-grade plastic that co-mingled recyclables produce, Nelson said, as well as increased labor at sort facilities down the line. "They are recycled into picnic benches and those types of things. It's not a closed loop," she said. "It's not taking a plastic bottle, using it for water, and having it reprocessed into another water bottle." Chertudi said Boise has not seen a significant reduction in revenue since implementation in 2009, even though the change occurred as market prices for co-mingled recyclables were at the lowest rate she'd seen since she began at the city in 1995. "We launched the program at a time when the recycling market was at its worst," she said. "[But] we more than made up for it in the increase in volume. It really was not an issue." Nelson, however, expressed concern over the fluctuating rates of co-mingled recyclables. When she began the study, the rates were $27 a ton. They have since risen to $45 a ton, but she said they could drop at any time. "I don't know if that has something to do with the current economy, or if this is something we can expect in the future," she said. An alternative is to implement a dual-stream program that would separate cardboard from plastic and aluminum. The system would not be as simple for users, but Nelson said it could produce more revenue. "We receive quite a bit of money from cardboard because it can go straight to the manufacturer," she said. Cardboard is not currently recyclable curbside in Blaine County, though there are receptacles in Ketchum and Hailey. Glass would need to be separated from other recyclables in either case. Chertudi said sort facilities can't handle the glass, and including it dramatically reduces the value of the material. Boise has a contract for recycling with Allied Waste, a state branch of national haulers Republic Services. Recycled materials are processed and baled through Western Recycling, a Boise-based company that markets the waste across the West Coast. Chertudi said the greatest demand is from sort facilities in Portland and Tacoma, adding that there's a high demand for Boise recyclables because the city continually strives to keep the stream free of contaminants. "People are fighting for our stuff," she said. Coeur d'Alene made the switch to single-stream late last year, with Twin Falls following earlier this year. Jerome is also considering the move, but is asking voters to decide if they would pay $3.50 per year for the convenience of not having to sort at the curb. Blaine County commissioners said they were hesitant to make a switch without more public input, especially as Nelson's figures showed a significant drop in revenue. Commissioner Tom Bowman said he wasn't sure what the goal of switching to a single-stream system would be, though Commissioner Larry Schoen said increasing participation in recycling can itself be a goal, even if it means revenue might drop. "Real environmental leadership means doing what's best even if it challenges people's accepted wisdom," he said. Nelson said the county recycling center will remain "in the black" for fiscal 2012, as any change in recycling method would not be put into place before the new fiscal year.